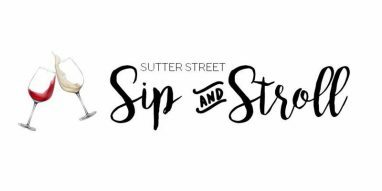 Sutter Street Sip and Stroll returns April 6. Last year sold out quickly, and it looks like it’s headed that way again. Sip and Stroll gives you an opportunity to try local wines and nibbles in local shops in Folsom’s Historic District. Wine, food, and live music in a beautiful setting. Who could ask for more? Located on Sutter Street from Scott St. down to Reading St. Enjoy The Ophir Prison Band, The Pony Express, Soap Box Derby Cars, wild west groups, vintage fire & police vehicles, horses, clubs and much more! Come on out for some good old fashioned fun! John Wayne (Jeff Sutherland) and other characters throughout the district. Ophir Prison Band performing in the parade and after the parade at the amphitheater. Come out and show your LOVE for our HOMETOWN! 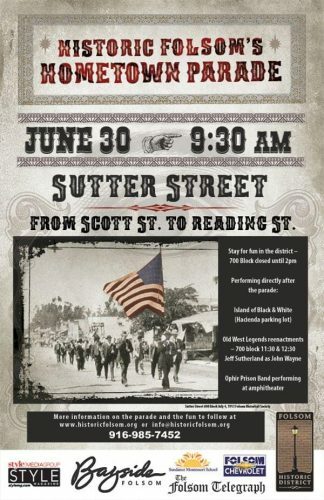 Park at 905 Leidesdorff St – $2.00 parking donation towards events in Historic Folsom.